He grew up as the son of legendary Detroit Tigers announcer Ernie Harwell. Most importantly, Gray knows baseball fans. He went to Comerica Park in 2010 to thank members of a grateful city who wanted to pay their last respects upon Ernie’s death. We can thank the Florida minister for sharing more memories of his father. 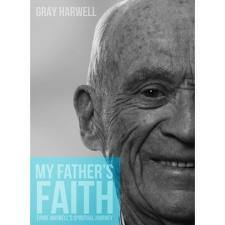 His book My Father’s Faith is new for this season. Currently, the title is available only as an Amazon.com e-book, although a print version is expected in May. Q: When you were young, how did your Dad explain the mystique of autographs? A: My dad never had to explain the mystique of autographs to me because as a boy I was after autographs from the ballplayers, just as the fans were trying to get dad’s. After an early Baltimore Orioles game ( 1956 or ‘7 ) I was in the clubhouse after the game with my dad when I naively asked a young pitcher who had just lost the game for his autograph. He turned a red angry face towards me and said, ” yeah, I’ll sign in in my blood”. My mother and brother and I were so used to people coming up to dad for his autograph that we really didn’t even think anything of it It was just the way it always was for us and we hardly noticed. Q: How was your Dad with autograph requests by mail? A: Dad always tried to respond to his mail. He remembered when he was just a fan himself and how much it meant to him when people he admired would write him back. Mom always helped dad with his mail, as a former English teacher she was his “spellcheck’ and editor for just about everything he wrote. At almost 93, she can still beat me at Scrabble! Q: What baseball content will we find in your book? A: The baseball content in my book is mostly a summary of the high points of dad’s amazing seven decades experiencing baseball history first hand. There are also some baseball stories that many have never heard, related especially to his faith. I had the privilege of being the Bible study leader for the Tigers when they were World Champions in 1984. My Father’s Faith recounts some of the great experiences Dad and I enjoyed together in Baseball Chapel that year with Lance Parrish, Darrell Evans, Howard Johnson and others. I also tell how sports writer, Waddy Spoelstra, and Dad were unlikely instigators of Baseball Chapel in the early ’70s. Q: Anything else you’d like fans to know? A: I would love your readers to buy My Father’s Faith because I think they’ll enjoy discovering what really made my dad the amazing man he was. As his youngest son, I tell “the rest of his story”, from a very personal perspective. My mailing address is 12618 Grandezza Circle, Estero, FL 33928. The book in print should be available on amazon .com “in the next few days”, following your blog on the 13th. I’d be glad to furnish a bookplate with my autograph for any of your readers who purchase my book and send me a self-addressed stamped envelope. Thanks so much for giving your readers a chance to discover My Father’s Faith. They can get the ebook on amazon.com Kindle right now, and the print version on amazon.com by next week. I look forward to hearing their comments and signing their bookplates.